Do you leave a book open when you’re done reading it? The same holds true to writing a business email — you need to close it when you’re done. But don’t just type the same email sign-offs into every message. Each sign off should vary depending on the context of your outreach. Below, we’ve compiled 15 common email situations and the best ways to end your email in each. BONUS: This tool shows you when your emails are being read — and clicked. Do: Use discretion, include your first name, check for typos, and remember your ultimate goal. Don’t: Use the same sign off every single time. 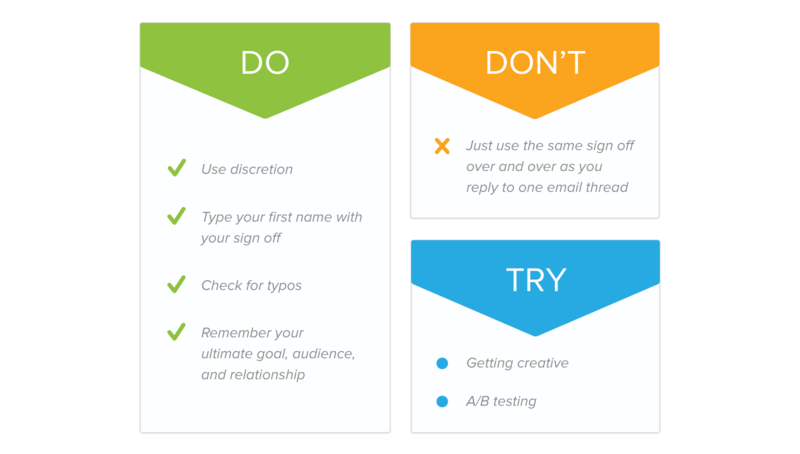 Try: Getting creative and A/B testing different sign offs. 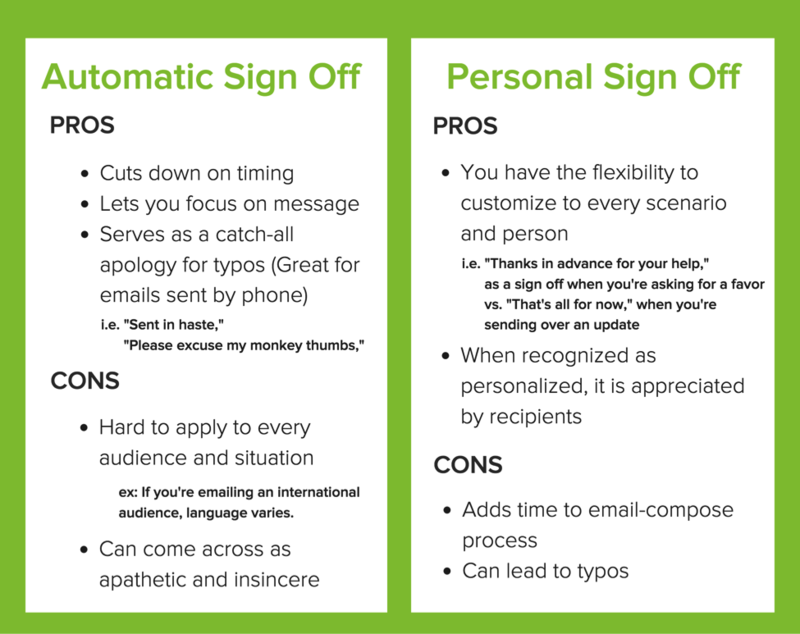 Add a general sign-off to your email signature to auto-insert itself into outgoing emails. Write out different sign-offs for each message so you can tailor in real-time what you say. A general rule of thumb: personalize your sign off every time. Only add a blanket message to the top of your email signature if it’s an apology for potential typos (see example #8 below) or an important notice. It’s worth the two seconds of time it takes to write a sign off for each email, and you can use a Gmail extension to spot-check for typos as you write. Now — ready to learn how to end an email for every possible professional context you could find yourself in? Read on for our favorite tips & tricks. Sign offs can be catalysts for action when they include a gentle reminder. As humans, we respond to visual cues. It’s what makes us skip to headlines as we read and what makes sight associations affect our memory. Research shows that when you associate a task with something in your line of sight, it increases the likelihood of you doing that thing by over 40%. Keep in mind: your email might be scanned. According to eye tracking studies, people read in an “F” pattern. Which means that your left-aligned sign off is the final thing they see in the body of your email. This creates a final chance to remind them to say “yes” to a meeting. 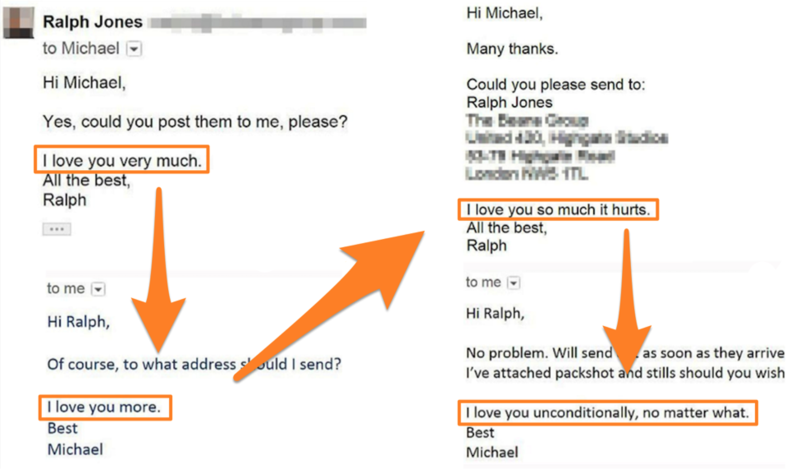 Test: If you’re sending a sales email, try adding a P.S. line to reiterate: 1) what’s in it for them, and 2) the short amount of time being asked for. Tip: If their follow-up might require some time and/or they typically need a second nudge, set a reminder that monitors whether they reply and pings you if they don’t at the day/time you prefer. See when, where, and on what device your emails are being opened. By addressing that you’re going to be in contact with each other, you leave the lines open to further communication. The person (or people) receiving your email might have feedback, questions, or concerns, so bear this in mind. Also, if there’s more information to come, let them know. We all like a good shortcut to getting something done. Well, sending your email at the best time for your recipient no longer means waiting around. You can write it now and schedule it for later, personalizing your email sign-offs for when it will land in their inbox. “Have a great week,” (If you’re sending on a Monday or Tuesday and don’t expect an immediate reply). You completed a project with someone, and it went great! 🎉 Now take a second to show some extra appreciation for your collaborator — it’ll go a long way. Research shows that 50% of working Americans would rather be appreciated than have the opportunity to advance in their careers. That’s pretty huge, considering how much we all value personal growth. Another instance of summarizing your main points. If your email was quickly scanned over, reiterate your main point to complete a task. Never forget a task again with scheduled reminders that land in your Gmail inbox. When someone gives you a compliment, you feel obliged to give one back. Right? It’s called the Rule of Obligation. You might need a favor from your recipient in the future, so end your email with a final note that further recognizes their accomplishment. It will create subconscious, positive attitudes of you and your company. So if your goal is to really get someone’s attention, break it. If you don’t start your email with a salutation (“hi, “hello,” “hey,” etc. ), you don’t need a formal sign off. It’s like an Irish exit at a social gathering — it happens sometimes, and everyone understands. After you ace your email ending, the last thing on your checklist should be sending the email at the right time. Sometimes it’s easy to overlook, but your recipient could live in a different time zone or work on a different schedule. According to our data, even bordering cities tend to have different best times to send based on their inbox activity. That’s why we created our Best Time to Send Interactive Map.